THE past two rainy seasons 65-year-old Ramdas Rana has spent much of his sleeping hours adjusting his bed to an elusive dry patch. The thatched roof of his hut has been leaking since 2008. He could not repair it because the grass used for thatching is out of bounds for him. Rana and other tribals of the Tharu community in Surma village in Dudhwa National Park used grass collected from the forests to make and rep air their huts every year. Three years ago the forest department stopped them from collecting it. This despite the Forest Rights Act (FRA), 2006, that recognises rights of the forest dwellers over minor forest produce. The department instead burnt the grass. The residents of the villages have now become aw are of their rights. On January 15, the village forest rights committees of Surma and other 36 villages served a notice to the park administration. They warned of legal action under FRA if they were denied entry for collecting forest produce. The committees are formed under the Act to recommend grant of titles for the rights claimed by the forest dwelling individuals and communities. The committees, in their notice, informed the administration that the residents would enter en masse on January 20 and collect the grass. The district administration called a meeting of the forest and tribal welfare department officials and the committee members on January 27. The authorities were asked to allow the tribals to take the produce till the process of disposing of the claims under FRA is not complete. “I have started repairing the roof,” said Rana. The victory for Rana and others has come after a long struggle. Thirty-seven out of the total 39 villages from the park were relocated when Dudhwa was notified in 1977. They were later converted to revenue villages in 1986. 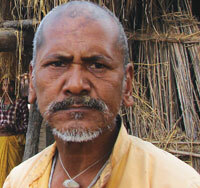 The tribals of Surma and Golbhoji village did not accept the relocation. They kept fighting for their traditional rights. In 2003, the Allahabad High Court ordered relocation of these villages. But it could not be done as alternative land was unavailable. It was only after FRA was enacted in 2007, the relocation was put on hold and the process of the recognition of rights started. I could buy only a metre of plastic sheet for Rs 500 two years ago. This barely covered the part of roof over my bed. The residents alleged the department earlier extorted money and crops from them to collect the grass. When the FRA process started they stopped payments and complained to the district administration. Sanjay Pathak, deputy director of the park, denied the allegations. The district magistrate of Lakhimpur Kheeri issued an order in January 2009 allowing tribals to collect forest produce as the implementation of FRA was under process. But the department overlooked it and burnt the grass. People alleged it also began harassing them. “We have been served notices by the department for the crimes we did not commit. When we came to know that FRA empowers us, we decided to serve a notice to it for its illegalities,” said Ramchadra Rana, member of the statelevel FRA monitoring committee. This year, the tribals have started collecting grass, but the department is still wary. “FRA does not give suo moto rights to people. Unless the claims are processed, we cannot allow them to exploit the resources,” Pathak said. He added only two villages fall in the forest reserve area, so others cannot stake claim on its produce. Sanjay Upadhyay, a Delhi-based environment lawyer, said the villages which were converted to revenue villages can claim forest rights traditionally enjoyed by them. The tussle may continue, but Ramdas Rana can enjoy a good sleep next rainy season. Fresh from a touring experience of the Dudhwa National Park,as a common nature loving citizen, the news of allowing the local villagers to use the sparse resources of the forests, gave me a shiver down my spine.A national park where every rules of maintaining the nature in its pristine form, as recommended by various government committees has been flouted, where a state highway connecting the Nepal border are running through the buffer areas bordering core areas, where a railway line up to Dudhwa station (and beyond), through the core areas are frequently slaughtering innocent lives of tigers, deers and even elephants, where even after touring through several ranges of the TIGER RESERVE, not even a pug mark was traceable by me, where even hoof marks of different prey bases of the Lord of the Jungle are becoming rare day by day,the precedent of allowing Tharu tribes to fend of their basic need may become another fissure through which the vested anti national interests of the politician wood mafia nexus will invariably be poking their ugly obtrusive nose, resulting in annihilation the last remnants of Himalayan Tarai forests of this world.